If you want internet using GLOBE network, you need to activate first your phone 3G/GPRS/MMS settings. Here I am writing the how-to in setting your internet connection with Globe. You can activate Globe GPRS/MMS/3G settings via text and manual configuration, please see below. and then wait for the configuration settings from Globe. If you received "invalid keyword" response from Globe using your new phone model, you can use the example above. You can still receive configuration settings even if it is not your exact phone model. Sometimes Globe doesn't recognize new models of cellphone in this kind activation method. 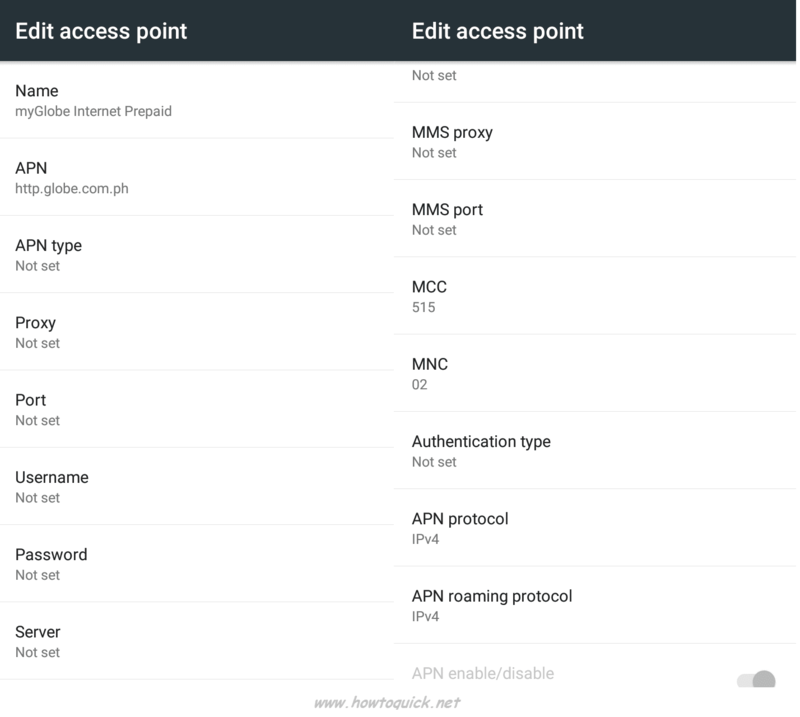 Note: If you're on Postpaid plan, use myGlobe Internet APN settings. For prepaid use myGlobe INET. 1. On your phone Menu, go to Applications. 6. Wait for the configuration message then Save! 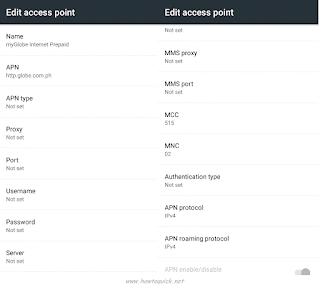 To use above settings on your Android phone see Manual Android APN settings. Feel free to post your questions here so that others can help us resolve your problem and issues regarding connectivity on your mobile phone. if i not messages to 2951 is network does not work???.... or still works?? you may use manual configuration or you may text to Globe for you to receive GPRS, MMS, 3G settings on your mobile. what's the homepage of MyGlobeInet? is it available for tm users also? how to configure myphone QW29 dou with globe?please help. thanks. Next, select Profile> for Globe select myGlobeconnector myGlobe INET then Activate. hello. can anyone help me on how to configure my nokia asha 205 (dualsim)? i tried to send go to 2951 but it says that the configuration is not compatible with my unit. thanks! By this settings can i used internet without wifi or just load? Bakit po ayaw sa samsung galaxy y..? im using a globe sim en i do follow the instructions on how to activate my gprs in my nokia c3 but it says " you entered an invalid keyword" i did a lot of trying but still same reply.i also register on allnet but i cant use the promo..help me what should i do ..its useless!!!!!! HOW TO USE GLOBE UNLISURF IN SAMSUNG GALXY Y? Hello I followed carefully the manual settings for Globe GPRS and Internet but when I try to navigate any sites in my opera browser the output is always "Connection Failed". I registered my phone in POWERSURF TIME 15. By the way I am using myphone A848 duo. Please help me guys. I also tried the method 1 and 2 but the responsed of globe is invalid keyword. What should I do? when i try to save the inet gprs and mms settings in my phone there is an error. "IMSI check error". what does it means? please help me! my phone is not compatible to received the setting. samsung Gt-s3778V is another way?? ?please help me. thanks! Hi! !I hope you can also help me set up the settings for my old phone. I got the Cherry mobile T1, I'd lost the settings for accessing FB and Twitter and YAhoo as well. Hope you can help me with this.. Thanks! More power! Hi po. .how can I activate gprs settings sa cherry mobile w7 gamit ang globe sim lagi ko naman pong tine-text ang 2951 kaso sabe "I have entered invalid keyword" sinubukan ko rin yung method 2. ayaw pa rin. help naman po. pano naman po sa SONY ERICSON LWW WT19i ? what if in tablet? and how? pano po ba sa nokia 200?? what about O+ 8.9 Android? can't figure how to use my phone.. always invalid as per globe reply.. Select your your network (Globe, Smart or Sun Cellular) simcard. in my Samsung GT-s3353 it also doesnt work..why..
hi SIR i did and use the handset model as N70 and when i receive the mesg setting it requires me a pin so what is the pin? Ey... I'm using Cherry Mobile Apollo. It asks me for PIN, but 1234 doesn't work? Meron pa bang iba? hi, panu po pag s xperia M..
mobile data on my galaxy note II still not working, i tried all APN's. my uncle says its because of roaming sevices that it disables mobile data. how to activate it again. Hi sir. I'm using Samsung Galaxy Chat BB530. Ayaw naman po gumana lahat ng method? wala pong lumalabas sa taas na data signal. Hi Sir Pa answer naman ng tanung ko . tapos ang lumalabas po is Server Failure bakit po kaya ? PA ANSWER PO PLEASE THANKS . ! how about N8? it doesn't work. help me please. Thank you, its work . HELLO..help pls.. how to set STARMOBILE B506?... i tried the suggestion above but still can't connect... any suggestion? ..thank you.. There's no configuration settings arrived. is there a way sa iphone 4s to connect? i tried pero ayaw p rin..
i use to put http.globe.com.ph sa packet data acc. point important yan. How to enable my data for my iphone? How to activate my samsung galaxy MT-211? PLEASE HELP THANK YOU. Hi .patulong naman po ano po ung keyword ?